On Trinity Sunday, June 20, 1886, seven people gathered to form an Episcopal Mission in Northport. Their meeting place was the loft of the newly-formed Edward Thompson Publishing Company on Woodbine Avenue. It was the first, but by no means the last time that village and church were to act in concert, one contributing to the other as both developed together. Edward Thompson of that firm, and his associate, James Cockcroft, were both wardens; Mr. Cockroft provided the lot on Main Street where the church was built, largely because of an influx of Episcopalians into the Village (young southern attorneys hired by Mr. Thompson to work in his legal publishing business). The cornerstone of the current church was set in 1889 (one year after the Great Blizzard of 1888, when, it is said, the priest in charge was snowed in for a week with only a bag of clams for sustenance. He emerged after the storm to swear he would never eat another clam and parishioners were able to celebrate their Christmas Eve service in a completed building). In 1893 a pipe organ was installed and in 1903 a vested choir. Also in 1903 the parish began construction of a parish hall (then called a guildhall) next to the Church. By 1909, Northport had its own water service, eliminating the need for outhouses (‘cold and uncomfortable in winter, and hot and oppressive in the summer’, one account says) and Trinity’s parish hall was being used for “community events and fellowship” and had doubled in size. In 1913, Trinity parishioners were among residents of Northport and East Northport agreed to form a public library. Mrs. Marian Meany remembers moving into a little house on Laurel Avenue across the street from what was then Northport High School and is now Northport Middle School, with her husband Norman, who in the 1920’s came to manage the Northport Lumber Co. and became church treasurer and choirmaster. The high school had just graduated its first class the year before. By the 1930’s, Trinity had added two rooms and a kitchen to the parish hall and added a chancel, pulpit and lectern to the sanctuary. It was in the depths of the Depression and the Thompson Publishing Co., which had figured so largely in the church’s beginning, was gone, sold and relocated in 1935 to Brooklyn. WWII came and in 1944, a major change occurred at Trinity. For the first time since the Church’s inception, women were allowed to vote at annual and special meetings. In 1948 a house was purchased for use by clergy, and in 1954 St. Bede’s house was bought, renovated, and enlarged. After the war, Trinity and Northport prospered; Harry Richardson, a mayor during the 1950’s, was a parishioner; Jacob Harvin, a warden also served on the village board as trustee. 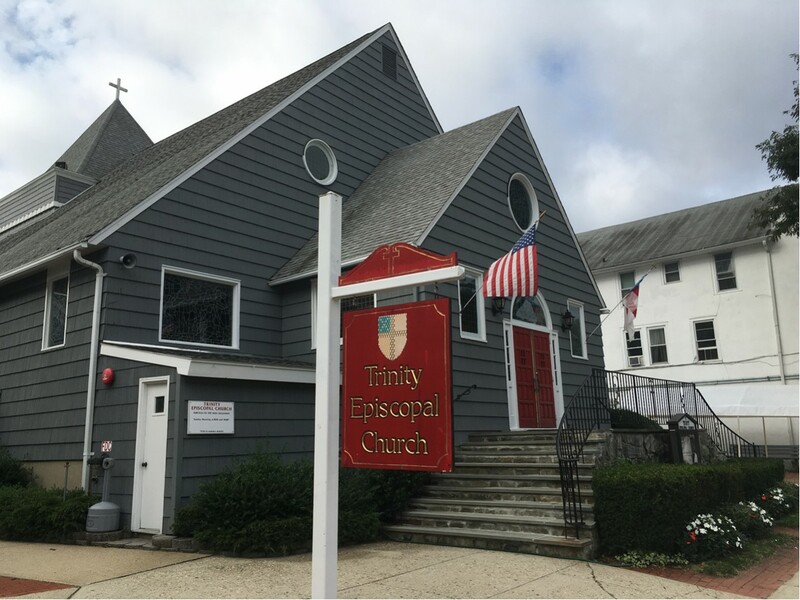 The suburban population growth, experienced throughout central and western Long Island, sparked new construction at Trinity, including a new parish hall. The Church’s parishioners continue to be active in the community. With the beginning of the 1960s Trinity commenced another wave of steady improvements, including the enlargement of the main worship space, the construction of the Church School (the Weaver building) in 1963, the purchase of a rectory in 1965 (sold later during the 1990s), the addition of a undercroft in 1967, and the construction of Houghton Hall (named for a former Warden; completed in 1976).